We believe this is the first effervescent Vitamin C in the UK without additives and artificial colouring or flavouring. Naturally sweetened with fruit sugar and a little sugar. Other brands may contain sodium laurel sulphate (SLS), artificial anti-foam agents or aspartame. Fizzes excellently in water or juice and tastes great. CONTAINS NO added salt, soya, wheat, gluten, yeast, lactose, dairy products, artificial preservatives, colours or flavourings. CONTAINS NO added salt, starch, soya, wheat, gluten, yeast, lactose, dairy products, artificial preservatives, colours or flavourings. Citric acid anhydrous, l-ascorbic acid, fructose, acidity regulator: sodium bicarbonate, acidity regulator: sodium carbonate; humectant: sorbitol; inulin, carrier: potato starch; natural flavouring: orange (carrier: potato maltodextrin; emulsifier: acacia gum; antioxidant: dl-alpha tocopherol); anti-caking agent: tricalcium phosphate; natural colours: red beet (carrier: potato maltodextrin; acidity regulator: citric acid), riboflavin-5-phosphate sodium; sweetener: steviol glycosides. Adults and Children over 13 years take 1/2 - 1 tablet a day, or as your health professional advises. Add to water. Below are reviews of Vit C - Vitamin C 1000mg - 20 Effervescent Tablets by bodykind customers. If you have tried this product we'd love to hear what you think so please leave a review. Excellent product & price. So pleased it is free from artificial sweeteners! Taste is OK, but dissolution is rather slow. Other brands do not have this drawback. 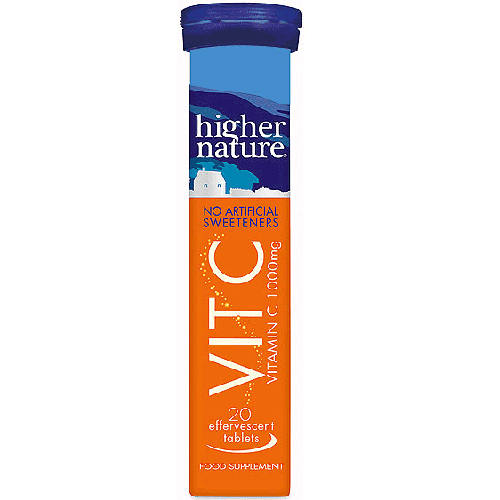 Vit C is believed to be the first effervescent vitamin C supplement in the UK to be additive and artificial flavouring-free. It is naturally sweetened with fruit sugar and a little sugar. It fizzes excellently in water or juice and tastes great.